While consumers rejoice at lower gasoline prices, states with fuel taxes that increase or decrease with the wholesale price of gasoline or the inflation rate are struggling to deal with declining revenues. Even in states with a per-gallon tax, fuel-efficient cars and reduced driving have combined to lower revenues from gas taxes, which are often dedicated to road maintenance and construction. With infrastructure crumbling across the country, even some tax-averse Republicans are considering raising gas taxes. Cheap gasoline makes such levies more politically palatable, since consumers are less likely to notice the extra burden when they are filling up. Florida, Maryland and New Hampshire allow gas taxes at the pump to rise or fall with inflation based on the Consumer Price Index. Massachusetts was set to do so this year, but voters last month scrapped that idea. Maine used to adjust for inflation, but that was repealed in 2012. Kentucky, North Carolina, Virginia, West Virginia and the District of Columbia adjust for inflation on the wholesale price of gasoline. 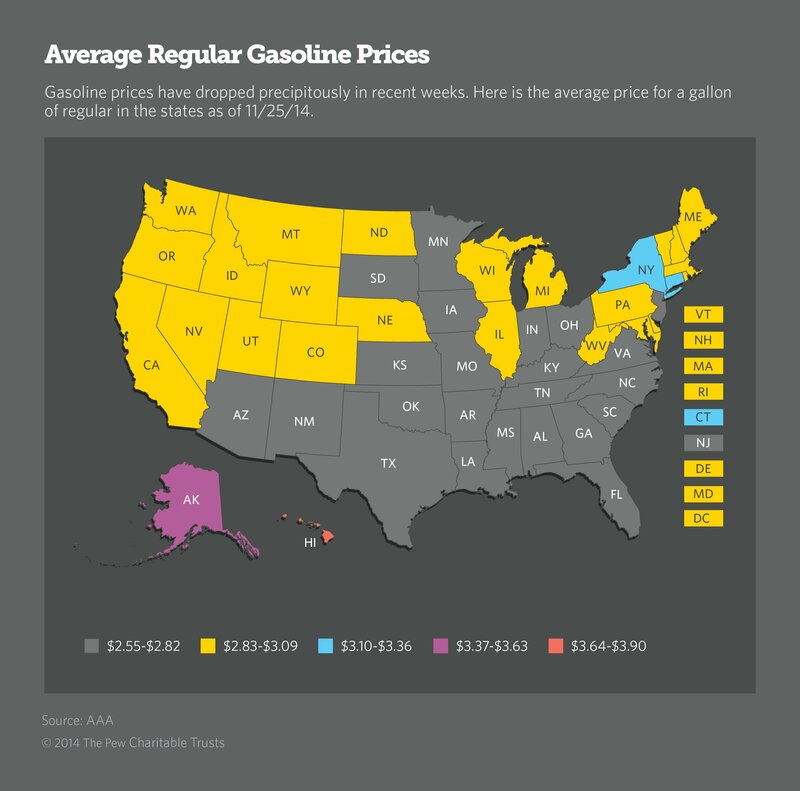 Most states have a separate gasoline tax, so they don’t apply regular sales taxes to gasoline. But Hawaii, Illinois, Indiana, and Michigan collect some or all of their gasoline tax revenue with a sales tax on purchases. California applies a partial sales tax on gasoline on the wholesale price and most counties in the state also impose a separate transportation sales tax. In New York, the state collects local sales taxes on gasoline. 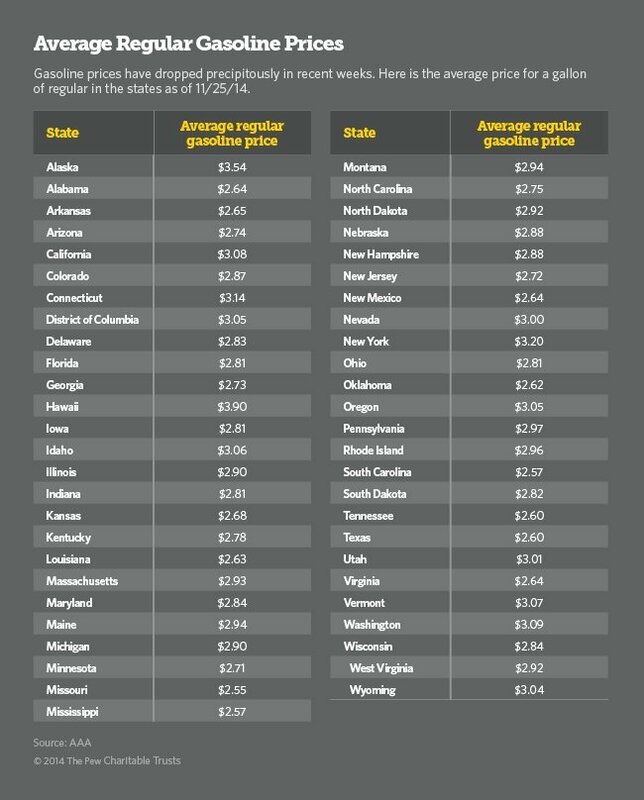 Most states and the federal government tax gas by the gallon. But even under that system, inflation erodes the value of the revenue. For example, the federal motor fuels tax, 18.4 cents per gallon, generates one-third fewer dollars in real purchasing terms than when it was last increased in 1993, according to an estimate by the Tax Foundation, a nonpartisan research organization. Indexing the tax to inflation was supposed to help ease that problem. And it did, almost every year of the past 20, as gas prices rose. But this year, gasoline prices have dropped precipitously. With that decline, revenues also have gone down in the states where the tax is indexed. Nowhere is that more apparent than in Kentucky, where fuel tax revenues have declined in four of the last five quarters, according to Chuck Wolfe, public affairs director for the state’s Transportation Cabinet. The biggest single decline was in the first quarter of this year, when the excise tax dropped 1.5 cents per gallon, Wolfe said. But in the quarter that begins New Year’s Day it will go down 4.3 cents a gallon. In December, 2013, the excise tax portion of the levy was 25.9 cents a gallon, plus a “supplemental” tax of a nickel a gallon for gasoline and 2 cents a gallon for diesel. With the latest drop in the price of gas, the variable excise tax will go to 21.2 cents a gallon in January. With the nickel a gallon supplemental tax and an “underground petroleum tank fee” of 1.4 cents a gallon, the total state tax paid by motorists for gasoline will be 27.6 cents a gallon in January, down from the current total of 31.9 cents a gallon. Last year, Gov. Steve Beshear, a Democrat, proposed that the legislature restore some of that year’s drop in the tax and set a floor, below which the tax could not fall. The Democratically-controlled House approved the bill, but the GOP-led Senate did not. The issue surfaced in the recent election campaign, with Republican House incumbents touting the fact that they “voted against the $60 million gas tax,” adding up what they thought the restoration of the 1.5 cents would mean to motorists. While the ad was powerful, the split in the legislature remained, with Democrats retaining a slim majority in the House. Kentucky Senate Transportation Committee Chairman Ernie Harris, a Republican, said the tax decrease will subtract $24 million from the state’s transportation fund between now and the end of June. He said there are two ways to fix the problem. Currently, state law says the tax can only rise by a maximum of 10 percent a year, regardless of what the price of gas does. One suggestion is to limit the drop in taxes to 10 percent annually as well, which would ease the problem but not fix it. The other idea is to establish a floor below which the tax can never fall. In Michigan, Republican Gov. Rick Snyder is making that case, with some success. The state Senate voted last month to increase gas taxes by 20 cents a gallon in steps over the next four years, in an effort to raise more than $1 billion to fix crumbling roads and bridges. The tax is based on the wholesale price of gasoline. The wholesale tax would begin at 9.5 percent on April 1, and gradually increase to 15.5 percent on Jan. 1, 2018. The House still has to vote on the measure and it could be altered at any step in the process. The Legislature hopes to finish it by the end of the year. Dave Murray, Snyder’s deputy press secretary, said the governor is backing the tax hike because he believes the state needs to invest in its infrastructure. “It’s long overdue and it’s been neglected for decades,” he said. Murray noted Snyder worked earlier in his term to cut the budget, and now is concentrating on getting $1 billion for road and bridge maintenance. Cheap gas may make the job of raising the tax easier, Murray said. But he emphasized that Snyder is well aware that it’s only a matter of time before gas prices increase again. The situation is different in New Jersey, which is also grappling with dwindling gas tax revenues and crumbling infrastructure. In that state, Republican Gov. Chris Christie is caught between a possible run for president—and possibly being tarred with a “tax raiser” brush in GOP primaries—and New Jersey’s infrastructure needs. At a town hall meeting this summer in New Jersey, Christie highlighted his opposition to a proposed gas tax increase advanced by some Democrats in the legislature (though not very hard). "They wanted to raise the gas tax by $2.4 billion. We said no to that," said Christie. Now, with the state’s transportation fund running out of money, the issue has come to a head again. The gas tax and a dedicated portion of the state sales tax generated about $1.2 billion for the fund in the current fiscal year, but that’s only about enough to service the fund’s debt. Without new revenues, New Jersey officials say, the debt payments will consume the entire fund by the time the new fiscal year starts in July. Patrick Murray, director of the Polling Institute at Monmouth University in New Jersey, said there is a consensus, particularly among industry representatives, that the state’s infrastructure is in dire need of repair. “New Jersey would be fine with a tax and I think he could sell it because every industry rep across the board is behind it,” he said.